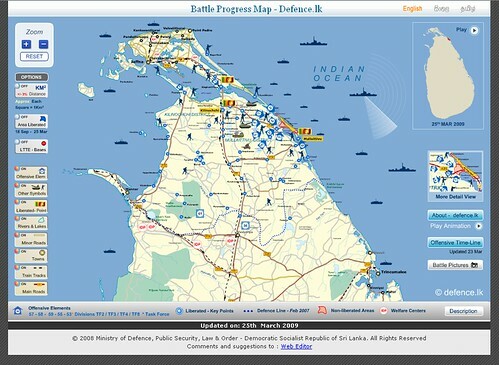 Before reading further, take a look at this impressive map web app from the Sri Lanka Ministry of Defence: http://www.defence.lk/orbat/Default.asp. Below is a screenshot of the main map. What’s your initial impression? It’s certainly well-made. The graphic design is very professional, the map is interactive, allowing users to turn features on and get more detail. There’s also an animated timeline map of the recent conflict in the north that shows the progression of troops and photos from the various towns.